The South Elkins layout has been dismantled. I've moved to the Cleveland, Ohio area and did not have a similar space to rebuild this model railroad. While the layout did not progress to an operating level, I learned a great deal from research, contacts, and construction. My next project has begun in the new home. You can follow along on ideas and progress at: Designing, Building and Operating Model Railroads. Welcome to South Elkins, West Virginia, on the Western Maryland Railway. I’m Eric Hansmann, the webmaster and builder of this HO scale railroad. Construction began on South Elkins in the fall of 2005, but planning and research began a few years before. I had been a fan of the Western Maryland Railway for several years and had the opportunity to visit Elkins and rummage about the shop buildings just before CSX pulled the rail from the yard area. I am also a member of the Mon Valley Railroad Club of West Virginia and various aspects of Western Maryland mountain railroading have influenced modeling at the club. A ten-wheeler creeps down the ramp from the Tygart Valley River bridge as it enters South Elkins. The wood reefer is spotted at the Elkins Provision Company, one of several businesses along Railroad Ave. in South Elkins. Information on this website is intended to convey the thinking, planning, methods, steps and processes I went through in building South Elkins. 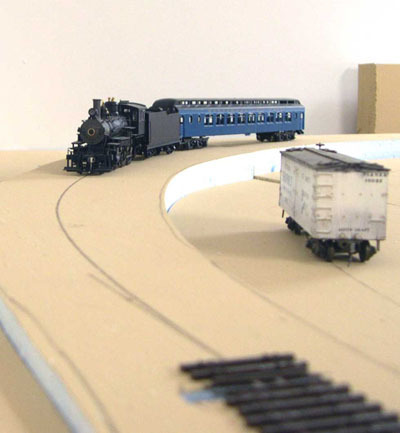 As with many model railroads, it is ever evolving and changing as the construction hours go by. I hope my notes and images on this project encourage you to set goals and work towards them in enjoyment of this wonderful hobby. We can easily face analysis paralysis with any project, and so many model railroaders do end up frozen in some aspect of their modeling. I know it has happened to me on a few occasions. “Just Do It” is a fine mantra. Dive right in to a project and see how it rolls. Having friends along to help will offer encouragement, knowledge and the extra hands to get help get things done. You will make mistakes, but you can’t learn how to do something properly without a little failure. To set the stage for you, it’s important to understand some of the geographical and historical aspects of Elkins, West Virginia. A concise review of early Elkins rail history can be found in the book “ West Virginia Central & Pittsburg Railway - A Western Maryland Predecessor”, by Alan Clarke. Additional resources can be found through the Western Maryland Railway Historical Society. They have quite an archive of material and a quarterly publication, the Blue Mountain Express, detailing various aspects of the Western Maryland Railway. There have also been a few local history books and other interesting volumes published over the ages. Sources are listed on the Links & Resources page. Regular layout updates will be posted to links on the Construction Methods page. The South Elkins story continues with a historical review.